- Large 50mm Drivers for Deep Bass, Wide Dynamic Range are significantly larger than most headphones for noticeably deeper bass, lower distortion and wider dynamic range; frequency response extends down to a low 5Hz. - 25mm Thick Urethane Earpads distribute pressure evenly around the ear for exceptional comfort over extended listening sessions. - Aura-Nomic Design driver faces the eardrum for enhanced sound, and headphones conform to the ear's anatomy for comfort. - Bio-Cellulose Diaphragm blended with Vectran enhances natural sound reproduction. - Extremely Wide Frequency Response 5Hz-30kHz spans frequencies above and below the entire audible sound spectrum. - Higher Power Neodymium Magnet for maximum energy with minimum size; ounce for ounce, Neodymium is far more powerful than conventional Samarium Cobalt or Aluminum magnets. - Replaceable Cloth Earpads are removable and washable. - Detachable Wire may be removed for storage convenience, or if you would like to purchase a longer cord. In my opinion, these are very nice headphones; overly large, yes, but really comfortable. I think the top end is sparkly crisp. The mids are nice, too. The bottom end is a bit loose and weak by default (for me), but once I started using a great headphone pre-amp, fed with digital optical audio into my mixer and boosted the bottom end, these sound GREAT. Next, I sealed the semi-open backs with packing tape (to make them closed back and now the bass sounds TIGHT (in a very good way). Using them in 2018, these are now a favorite pair. Being the curious guinea pig that I am in testing headphones, I ordered the Sony MDR-CD2000 from Etronics. I broke the headphones in, using music from various CDs, and then listened to them. Though my initial impressions were positive, they ultimately wore me down. These headphones were comfy, for sure - but here's where the good things end. The overall sound from these headphones is mediocre, even for the price that I paid for them. The bass is a little loose and lumpy, and the highs a bit harsh and grainy. The only saving grace about the sound from these headphones is the glorious midrange. And yes, I tried these headphones with both low-end and high-end audio equipment, with the same unexceptional performance. These headphones were efficient enough for use with weak portable audio equipment - but that only makes the flaws with the sound even more apparent. The single-sided cord is detachable for easy storage. The cord is covered in fabric instead of vinyl. The headband self-adjusts for even more comfort. But these headphones are so huge, they make you look like a Troklian cruiser operator! The bottom line is: There is little reason to choose the Sony MDR-CD2000 over most other open-back headphones that sell in the $150~$250 price range. The Grado SR-225, the Sennheiser HD 580 and HD 600, the AKG K501 and even the Beyerdynamic DT931 sound better overall than the Sony MDR-CD2000. The only open-back headphone in the $150~$250 price range that sounds worse than the MDR-CD2000 is the Sennheiser HD 590, with its overbright and incoherent sound. All the "comfort" luxuries are annoying and become a negative--I found that I preferred a normal adjusting headband over this self-adjusting one. The sound is ok, but not as good as Sennheiser''''s, which are ironically less money. Firstly, I don''''t own these cans. I did listen to them before deciding on a pair of headphones though, and I wanted to say why I ended up leaving the store with the Sennheiser HD 570''''s. Firstly, these have a much lower volume when turned up the same amount as most headphones--meaning they aren''''t the best for portables. They are quite comfordable, but I would say that they are almost too comfordable. The Sennheiser''''s completely cup your ear, and have soft padding to tightly grip your head without hurting at all. The sony''''s don''''t go over your ears, but actually go on them--they have some type of cloth separating you from the actual speaker, which I don''''t like in a headphone. The Sennheiser''''s also have a material separating the ear from the actual speaker, but the Sennheiser''''s actually put your ear inside them, while on the Sony''''s your ear is just pushed against the cloth. Second, the self-adjusting headband really does self-adjust, but I found that this being annoying to the point of a hassle, because yes, it self-adjusts, but it doesn''''t grip your head at all--weird headphone design, and really no good if you actually plan on using these in other situation besides sitting. 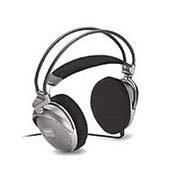 Thirdly, the Sennheiser''''s stuck out because they were much more balanced, smooth, and warm. They had more range--higher, clearer highs, and deeper, more accurate and natural bass. I am happy I own the Sennheiser''''s, which I believe actually had some effort put into the design and manufactoring process, while the Sony''''s are just another piece of mass-produced American crap--especially for the price.